Monoclonal antibody raised in mouse against the YSPTSPS repeat in the B1 subunit of RNA polymerase II. ChIP assays were performed using human HeLa cells, the Diagenode monoclonal antibody against Pol II (Cat. No. C15200004) and optimized PCR primer pairs for qPCR. ChIP was performed with the “iDeal ChIP-seq” kit (Cat. No. C01010051), using sheared chromatin from 1 million cells. A titration consisting of 1, 2, 5 and 10 μg of antibody per ChIP experiment was analyzed. IgG (2 μg/IP) was used as a negative IP control. Quantitative PCR was performed with primers specific for the promoter and the coding region of the constitutively expressed GAPDH and ACTB genes, used as positive controls, and for exon 2 of the inactive myoglobin (MB) gene and the Sat2 satellite repeat, used as negative controls. Figure 1 shows the recovery, expressed as a % of input (the relative amount of immunoprecipitated DNA compared to input DNA after qPCR analysis). 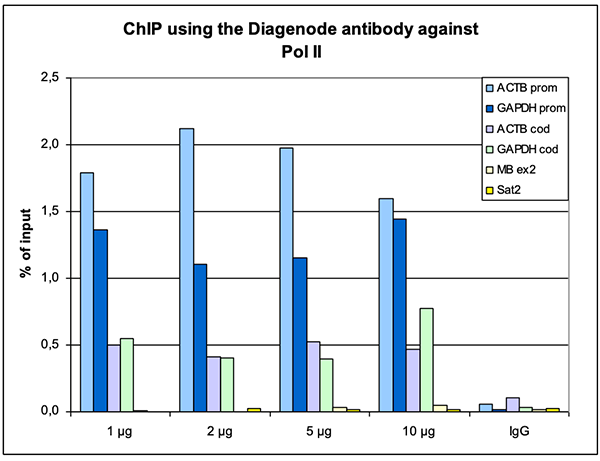 ChIP was performed on sheared chromatin from 1 million HeLaS3 cells using 1 μg of the Diagenode antibody against Pol II (Cat. No. C15200004) as described above. The IP’d DNA was subsequently analysed on an Illumina Genome Analyzer. Library preparation, cluster generation and sequencing were performed according to the manufacturer’s instructions. The 36 bp tags were aligned to the human genome using the ELAND algorithm. Figure 2 shows the peak distribution along the complete sequence and a 400 kb region of the X-chromosome (figure 2A and B, respectively), and in a two genomic regions surrounding the GAPDH and ACTB positive control genes (figure 2C and D). 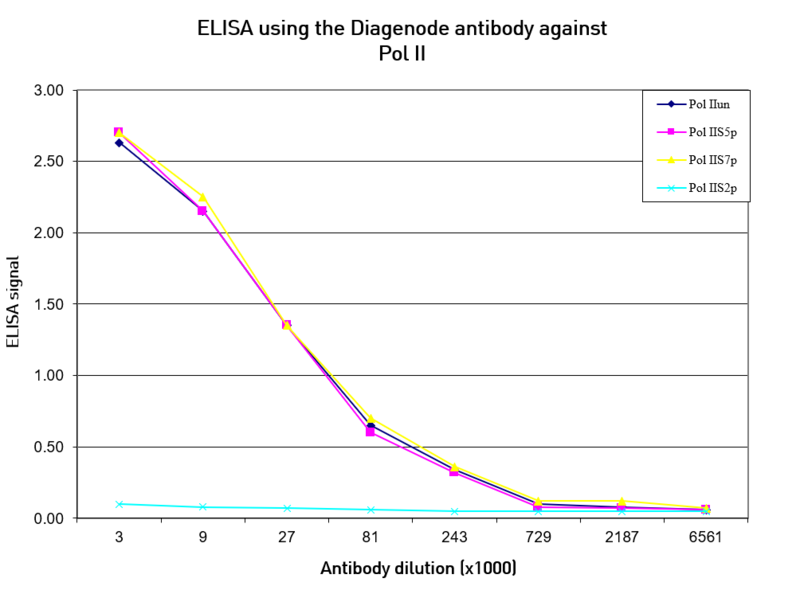 To test the specificity an ELISA was performed using a serial dilution of the Diagenode monoclonal antibody against Pol II (cat. No. C15200004). The wells were coated with peptides containing the unmodified C-terminal repeat sequence as well as different phosphorylated peptides. 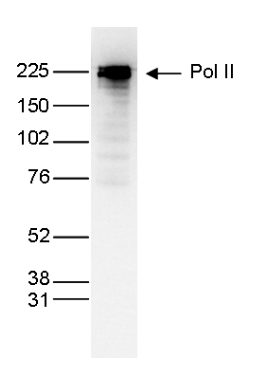 Figure 3 shows that the antibody recognizes the unphosphorylated Pol II as well as most phosphorylated forms. Figure 4. Western blot analysis using the Diagenode monoclonal antibody directed against Pol IINuclear extracts (25 μg) from HeLa cells were analysed by Western blot using the Diagenode monoclonal antibody against Pol II (Cat. No. C15200004) diluted 1:1,000 in TBS-Tween containing 5% skimmed milk. The position of the protein of interest is indicated on the right; the marker (in kDa) is shown on the left. Whole cell extracts (40 μg) from HeLa cells transfected with Pol II siRNA (lane 2) and from an untransfected control (lane 1) were analysed by Western blot using the Diagenode antibody against Pol II (Cat. No. C15200004) diluted 1:1,000 in TBS-Tween containing 5% skimmed milk. The position of the protein of interest is indicated on the right; the marker (in kDa) is shown on the left. HeLa cells were stained with the Diagenode antibody against Pol II (Cat. No. C15200004) and with DAPI. Cells were fixed with methanol and blocked with PBS/TX-100 containing 5% normal goat serum and 1% BSA. The cells were immunofluorescently labelled with the Pol II antibody (left) diluted 1:500 in blocking solution followed by an anti-mouse antibody conjugated to Alexa594. The middle panel shows staining of the nuclei with DAPI. A merge of the two stainings is shown on the right. I have used Diagenode's antibodies for my ChIP Seq experiments. The antibodies performed very well in our experiments with specific signal, and good signal to noise ratio. Antibodies used in our lab: Pol II Monoclonal Classic (C15200004). 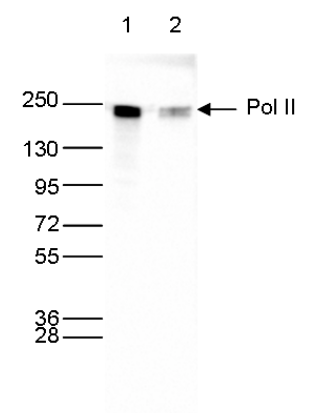 Diagenode strongly recommends using this:	Pol II monoclonal antibody - Classic (Diagenode Cat# C15200004 Lot# 001-12). Click here to copy to clipboard. The SS18-SSX Fusion Oncoprotein Hijacks BAF Complex Targeting and Function to Drive Synovial Sarcoma. iRNA-seq: computational method for genome-wide assessment of acute transcriptional regulation from total RNA-seq data.